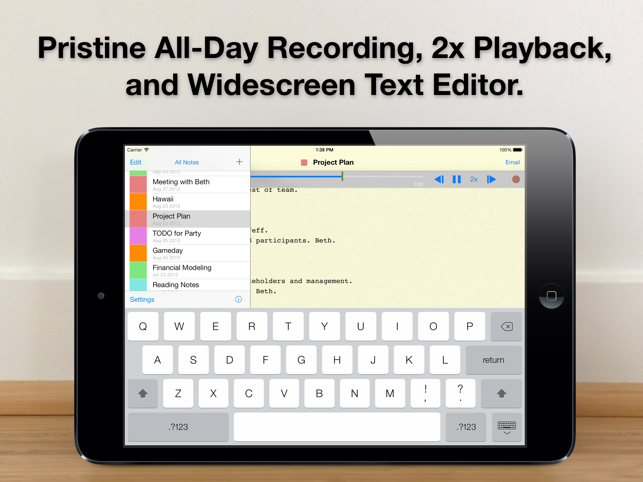 All-Day Audio Recorder, 2x Playback, and Wide-Screen Text Editor. - Everyone else: To capture your thoughts and ideas for all of life's projects. Stop struggling to take notes while keeping up with discussions. Audio Notebook captures everything that is said, so you don't have to worry about missing a thing. Record through your whole day and take notes at the same time. Edit and add to your notes while recording or reviewing later. 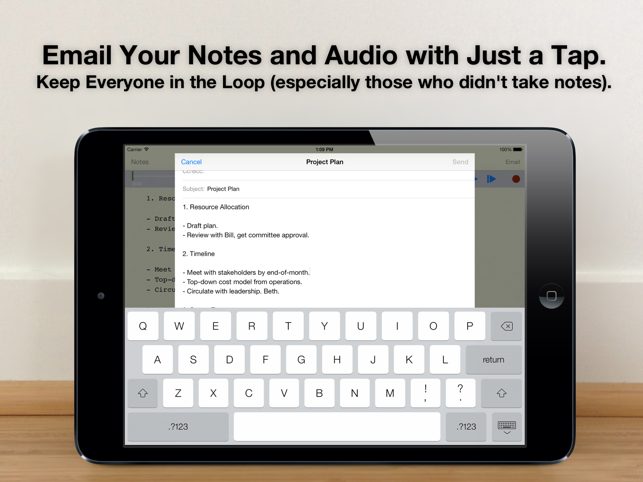 When you're done, easily email your notes and recordings with a tap. Leave your laptop behind. 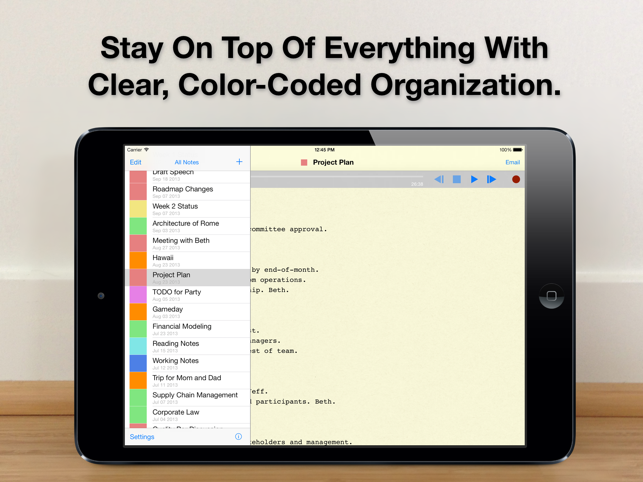 Stay on top of all your classes and meetings with just your iPad. 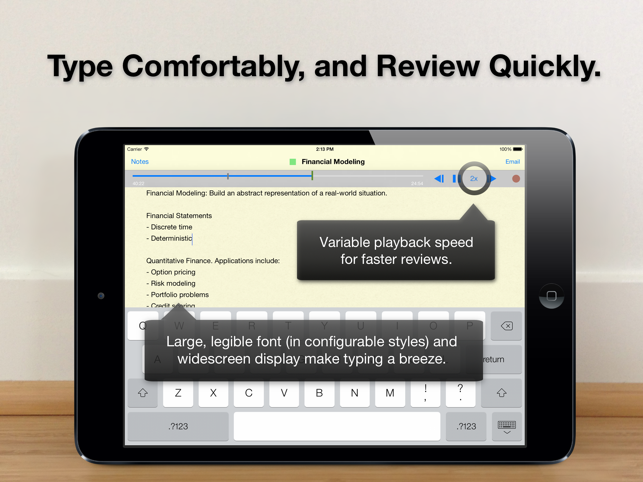 Reviews are a snap: Audio Notebook lets you breeze through recordings with up to 2x playback speed. Rewind by 5 seconds with just a tap, and capture every point with perfect recall. It's your data: Copy all your notes and audio to your Mac or PC with iTunes File Sharing at any time. 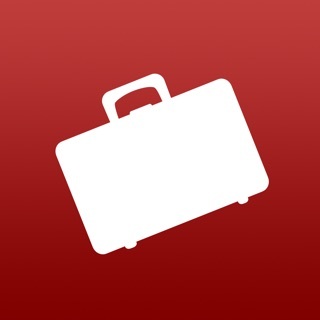 This is great for extra backups or sharing with others. It even works wirelessly over WiFi. 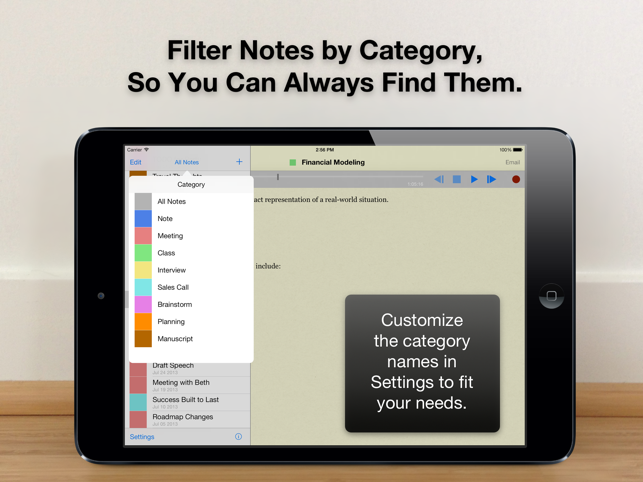 Color code your notes with multiple categories to find them easily and stay on top of all your projects. Unlike Apps ported from the iPhone, Audio Notebook makes full use of the iPad's larger screen. Notes take up the full screen width in landscape, and are presented with a large, legible font, so you don't have to squint. Pick between three beautiful fonts for your notes: Georgia, Helvetica Neue, or Courier. + Ability to share text and audio directly with other apps, including iMessage. When I take notes, it’s easier with a pencil. Especially in that classroom setting etc. Typing is great when writing but just isn’t The way to take notes naturally. I hope this app can add Apple Pencil integration and hand writing. Until then, I’ll stick with Notability for audio recording, handwriting and typing all in one app. That being said, if you don’t care about hand writing this app is terrific.